Raaga.com: Casting coup of the year: Shah Rukh Khan and Alia Bhatt to act to together! 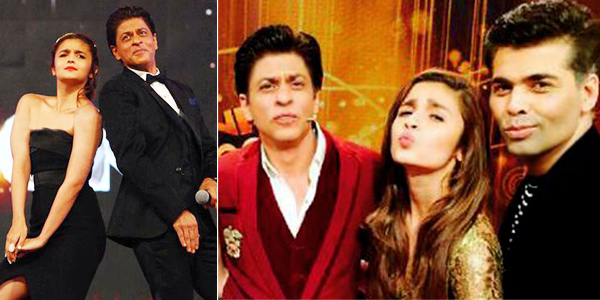 Casting coup of the year: Shah Rukh Khan and Alia Bhatt to act to together! Karan Johar has created a flutter in Bollywood with the announcement of 49 years Shah Rukh Khan and 22 years Aliya Bhatt working together in his next movie (Untitled) to be directed by the highly talented Gauri Shinde of ENGLISH VINGLISH fame. Karan Johar confirmed the announcement by tweeting that the movie is being jointly produced by Karan Johar’s Dharma Production in association with SRK home production Red Chilies Entertainment and Hope Productions. The highlight of his tweet is his emphasis on SHAH RUKH KHAN and ALIA BHATT. Gauri Shinde, wife of R.Balki, like Balki is known for making path breaking movies and according to her the movie is an avant-garde theme exploring the love journey of a young lady who romances three men of different ages in her life. With each relationship she experiences a new outlook on life. Initially Gauri Shinde had plans to cast Katrina Kaif in the lead role because as the movie progresses the role becomes much mature and intricate. The role is somewhat similar to the character of Raj Kapoor in MERANAAM JOKER, where he encounters three women in his life at different ages of his life. With Katrina Kaif backing out Aliya Bhatt has grabbed the opportunity. Like Alliya the audience too is gone crazy are desperate to see the rare combination. Though details about weather Shah Rukh Khan will romance with Aliya Bhatt are still unclear but from the storyline it is apparent that Aliya will certainly be romancing Shah Rukh Khan as he may perhaps be the third person, with whom she dates in the climax.